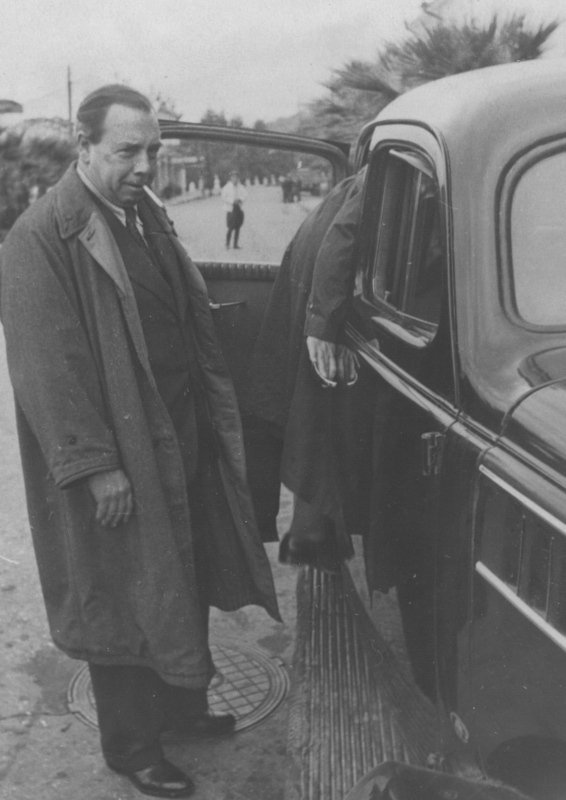 J.B. Priestley made his third Postscript broadcast just after Paris had fallen to the Germans on 14 June. He had recently joined the Local Defence Volunteers near his home on the Isle of Wight. The Volunteers, later known as the Home Guard, had been set up a month before. Men between 17 and 65 who were not in the regular army (too young or old, or in a reserved occupation) could volunteer their services to help repel an invasion: they would receive uniforms and be armed, but not paid. In this broadcast Priestley told his listeners about his first night on duty. It had reminded him of Thomas Hardy’s novels: gathered high on the down with the hurdle-maker and the shepherd, talking about hay and barley, facing the threat of invasion. He had felt part of a community, and part of a tradition: “There we were, ploughman and parson, shepherd and clerk, turning out at night, as our forefathers had often done before us, to keep watch and ward over the sleeping English hills and fields and homesteads.” This was comforting: the current threat, like the Napoleonic threat so often invoked in Hardy’s works, “would come down upon us; it would be terrible; but it would pass”. Priestley ended the piece by quoting Hardy’s poem In time of the breaking of nations. This is my favourite Postscript, because of the way Priestley evoked the Wessex landscape and Hardy’s perspective of deep time. Two days earlier, Priestley had broadcast a piece about the same night for one of the BBC’s overseas services. A Night on Duty with the Parashots was longer and much more informative, describing the uniforms, weapons and men in detail, particularly the gawky but very keen-eyed sentry Bill. Priestley explained how life in Britain now felt, how everyone was hurling their energies into the war effort. Matters for the French were of course even more difficult. He ended by quoting Walt Whitman’s O Star of France, published in 1871 when France was also in crisis. 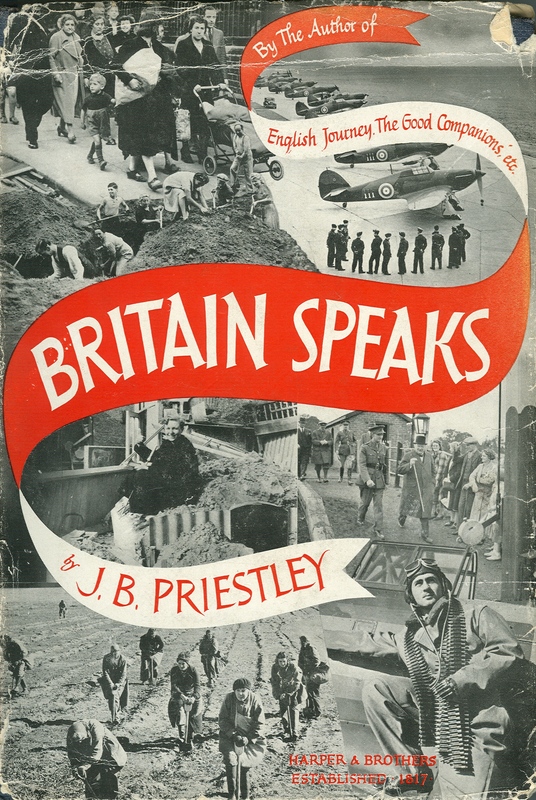 A Night on Duty … was published in the book shown here, Britain Speaks, a collection of Priestley’s overseas broadcasts (New York: Harper and Brothers, 1940). This volume can be misleading: the dustjacket implies the broadcasts were solely to the US and the title page confuses them with the Postscripts. The two pieces show how well Priestley understood radio and his audiences, subtly adapting the same experience for different purposes: comforting the British that this threat too would pass, providing overseas listeners with more detail and showing them how the British were coping. His wide knowledge of literature helped him choose the right poem for each audience. 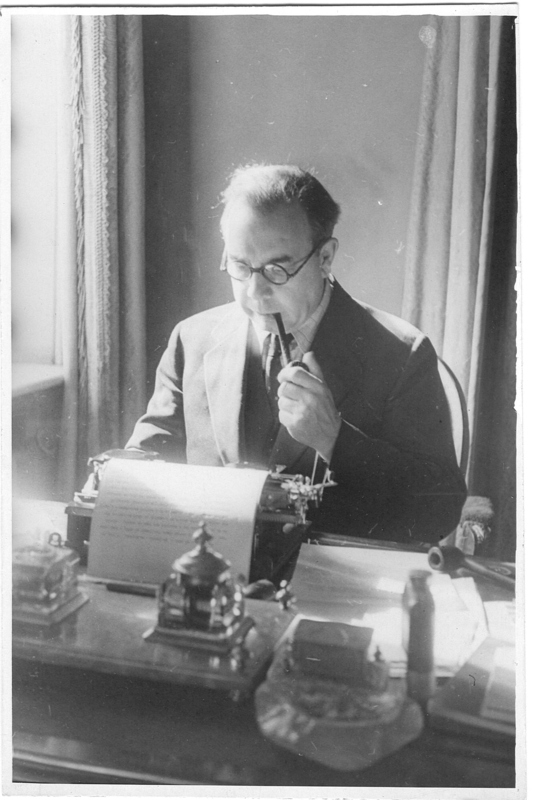 As promised in a previous post, over the next few weeks I will be discussing Priestley’s Postscript broadcasts and some of his World War II writings. I will try to stick to the Postscript broadcast schedule, starting with his first Postscript on 5 June. Meanwhile, a look back at a novel published just as the war was beginning, in September 1939. 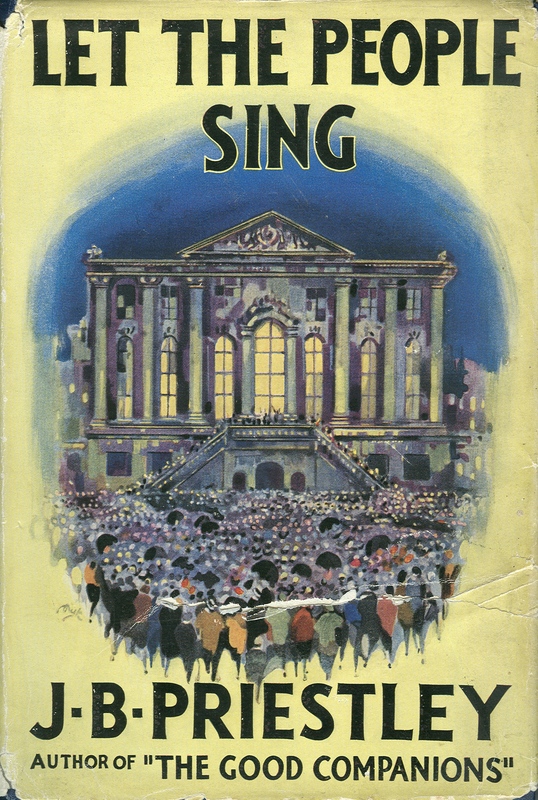 Let the People Sing was serialised by the BBC before its publication in book form. 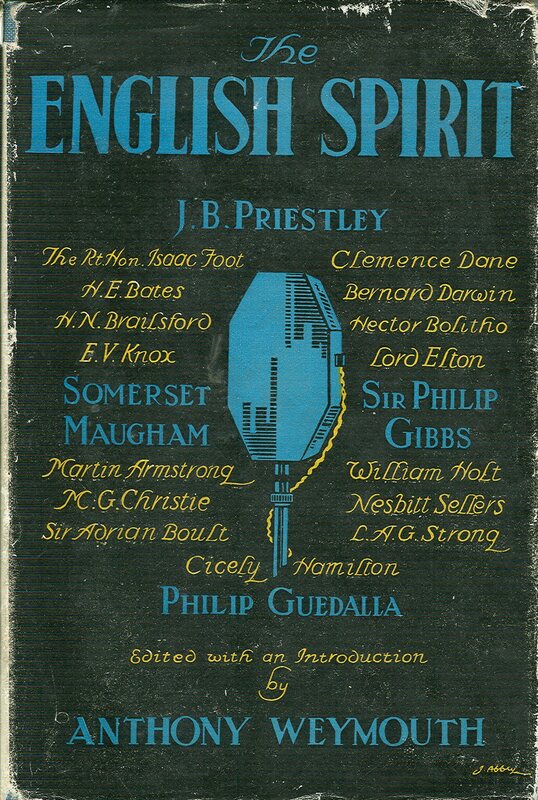 Priestley explained in his Author’s Note that there was a special reason for his agreeing to the BBC’s commission, when he had never allowed such serialisation before: “I agreed to let the BBC have a novel, partly because I felt we might be at war in the autumn … and that broadcasting would then be extremely valuable to the public”. He read the first broadcast himself, “on Sunday, the Third of September, the very day war was declared”. Priestley already understood the value of radio. BBC Archive: front cover of Radio Times 3-9 September 1939, advertising Priestley reading the novel, with picture of him at the microphone. Let the People Sing contained many of the elements that had delighted the public in Priestley’s Good Companions in 1929. It offered escapism at a dark time (the start of the Depression in GCs, the coming of war for LTPS). It is comic, lighthearted and benevolent in tone. Three diverse entertainers meet by chance (one a music hall comedian), and campaign to save Dunbury Market Hall for local music lovers, rather than United Plastics, who want to use it as a showroom for their products. The title became a popular catchphrase, and the novel was filmed in 1942 with Alastair Sim as Professor Kronak, the Czech professor who delights in etymology.